It’s a fact: New technologies are giving modern shoppers access to a huge amount of information about retailers and their products. They are using this information to shop around more competitively and carefully, which means retailers must also use new technologies to deliver a richer retail experience across all channels—and devices. All that consumer technology is having an enormous effect on the world of retail. Today’s in-store experience has become a far more complex environment over the last few decades. The increasing shift to the self-service format—which offers convenience, added choice and, sometimes, greater value—also brings complexity to the design and layout of the retail environment. Digital signage plays an enormous role in this area. The other dynamic is around the technological complexity retailers must have in order to support their infrastructure. From the POS terminals, self-service kiosks and readers to the network supporting the operations, retailers need to drive efficiencies by automating their processes, which enables informed, proactive business decisions. What does this mean for retailers? They need to think differently about their digital signage strategies and deployments—as a business strategy, not as an IT overhead item. The signage itself needs to be “smart,” focused on the customer, providing unique and relevant content, and integrated into retailers’ information systems so they can quickly and easily see what is and what is not working in-store (with a way to quickly make changes). I recently read a statement that I agree with: “The question is no longer ‘How can we make the in-store experience as satisfying as the web?’ But rather, ‘How can we make our stores more significant than showrooms for online merchants?” Therein lays the challenge. Having only in-store screens formerly known as “dumb terminals” adds little value to the retailer or the shopper. If you are simply deploying screens for information or directions, you are merely replacing old paper or cardboard signage with an electronic version of the same. However, if your signage helps you promote excess perishable inventory in real-time to encourage a quick sale, now it’s a business advantage. 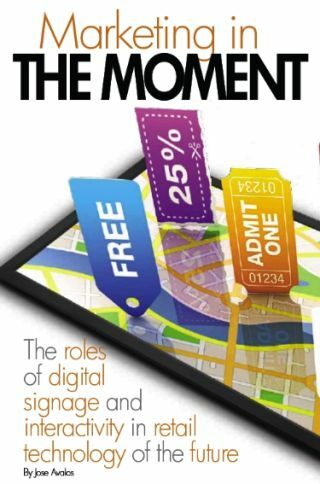 So, what will retail digital signage technologies of the future look like? Imagine that one of your high-spending customers who shops your brand (both off line and online) just walked into your store. She scans her cell phone, with her store loyalty number in it, on the reader at the front of the store. In moments, the store manager is alerted to her presence and her purchase history in real time. Well, this is all happening today. For those of you who missed it, Intel previewed this technology at NRF in January in their Connected Store POC. Giving the store manager the instantaneous information he needs to acquaint himself well with this customer and providing him the tools to deliver a relevant, personalized and high-touch shopping experience is a clear competitive advantage. How many people do you think she’ll tell about how well she was treated in that store? You can bet a lot. How does this translate into real life? It’s being able to order the shoes I want from the store—on the spot via kiosk DS technology—even when the retailer doesn’t have them in stock in my size. It’s the device capturing all of my credit card and shipping information immediately without asking me to re-enter it all. It’s about saving the sale, and saving the retailer and shopper a lot of hassles. In the end, it’s all part of creating a positive and painless shopping experience—and creating a differentiator. From a marketing perspective, Anonymous Video Analytics (AVA) technologies like Intel AIM Suite enable digital signage solutions to be smart and relevant to shoppers’ in-store experiences. These tools capture non-personal demographic information in real time to enable more relevant content, promotions and experiences for the store’s customers. Intel is looking at how to equip any future digital signage solutions with the ability to use technologies like AVA to measure audiences and provide more targeted messaging, as well as measure the effectiveness of the advertising to establish pricing. For example, a digital sign or self-serve kiosk equipped with AVA can automatically take on a different personality, with various offers and options based on demographic metrics information gathered in real time through AVA. Viewers can interact with these offers via a touch screen, opt to download them to their smartphones and take off on a guided shopping excursion. For instance, a petite woman might appreciate being offered a special promotion or sale in the petites department (with the signage height modified in real time to accommodate her height). Likewise, someone carrying a baby might want to know that diapers are on sale before he reaches the check-out line. An AVA-enabled DS solution can make that happen without collecting any personal information—in real time. This creates a new way for retailers to provide an engaging experience that, if intelligently and tastefully done, is welcomed by shoppers. Linking the store’s digital signage, kiosks, store loyalty programs, POS and point of wait can create sales lift (the holy grail of retailing) while also increasing customer service and loyalty. It’s taking the best of online, print, in-store promotions and media and making the whole bigger than the sum of its parts—that is what tomorrow’s retail digital signage environment will be all about. This connectivity enables a consumer to receive a relevant store coupon on her cell phone as she approaches the store on her way home from work. Instead of going straight home, her interest in stopping and shopping has been enabled via technology. Interactivity allows consumers like me to walk into that store and scan my shopper number on my cell phone again to get a buy one/get one offer that would incent me to buy more and to think highly of the retailer who employs this digital strategy. You walk into your favorite mall and are greeted by a digital sign promoting a number of special offers. One of them catches your interest—a possible gift for your son. However, it’s your lunch hour and you are pressed for time, so you download the information about this special to your mobile device and lock in the price for 72 hours. Now, because it’s lunch time, you realize you are hungry. Fortunately, your favorite restaurant in the mall (as you were informed when you scanned your smartphone on the mall reader) has sent a message to your mobile phone informing you that your favorite meal is on special. You text your order back with instructions to have it ready for takeout because you’re in a hurry. Let’s face it: In-store shopping is never going away. And mobile channels will continue to grow and evolve. Shoppers’ in-store expectations will increase along with their sophistication, so retailers and brands must be focused on providing a great in-store experience to keep shoppers coming back for more. Digital signage technologies can enhance the retailers’ ability to meet shoppers’ expectations and retailers’ goals. Watch and see. Jose Avalos is the Retail Sector General Manager for Intel Corporation in the Intelligent Systems Group. In this role, Jose leads Intel’s worldwide Retail & Digital Signage businesses and his organization is responsible for delivering Intel’s Intelligent Retail & Digital Signage Platforms, Software and Services, as well as initiatives to fuel the growth of these Industries. Jose has a multi-faceted career with numerous General Management and Director level positions at Intel in Business, Marketing and Engineering. Prior to his current role, Jose was General Manager of Intel’s Ultra-wideband Networking Operation. Jose has represented Intel at SEMATECH, at the Arizona Hispanic Chamber of Commerce, and at the Digital Signage Association advisory boards, and currently represents Intel at the ASU W.P. Carey School of Business Center for Services Leadership board. He received his BS in EE from the University of Illinois at Champaign-Urbana and his MSE in EE from the Arizona State University. In addition, Jose has completed Executive Leadership Programs at the Darden School of Business at the University of Virginia and at the UCLA Anderson School of Management.